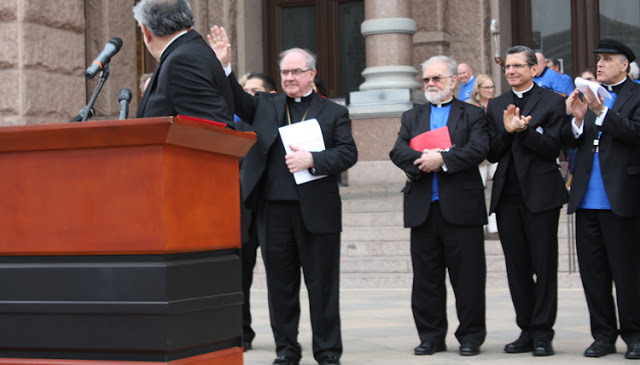 On Tuesday of this week 11 bishops from Texas, along with 1,500 Catholics from throughout the state, participated in the Advocacy Day in Austin organized by the Texas Catholic Conference. In addition to a rally on the south lawn of the Capitol at noon, the bishops testified before various committees regarding several issues as well as made visits to the Speaker of the House, the Lt. Governor’s staff (he was out of town) and with Gov. Rick Perry. We were able to present the position of the Church on certain key areas. The delegations from the dioceses were able to meet with their representatives. The delegation from Corpus Christi met with Representatives Todd Hunter, J. M. Lozano and Abel Herrero. The Advocacy Day began the night before with a beautiful Mass with all the bishops present at St. Mary’s Cathedral. Please continue to pray for our legislators and keep in your prayers the several priorities that the Texas Catholic Conference is working on. You can learn more about this issues that their Web site http://www.txcatholic.org.